First casualties reported as Gaza terrorists continue to fire rockets at southern Israel. 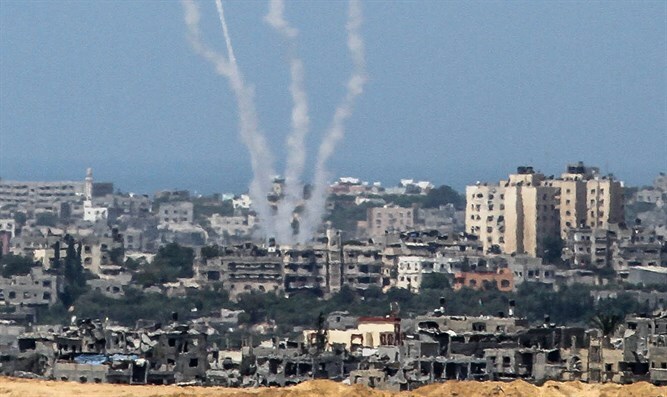 Terrorists from the Gaza Strip launched dozens of rockets into Israel on Tuesday. Three IDF soldiers were wounded by shrapnel from a rocket fired at the Eshkol Regional Council. The wounded were treated by Magen David Adom paramedics and evacuated to Soroka Medical Center in Be'er Sheva in light - to - moderate condition. In addition, United Hatzalah reported that its Psychotrauma and Crisis Response Unit volunteers have treated 10 people in various communities in the Gaza periphery who have suffered emotional shock due to the barrage of rockets and the resulting iron dome interceptions. In one incident mother and daughter who suffered emotional shock after the iron dome shot down a rocket in their vicinity. Psychotrauma and Crisis Response Unit volunteers in the entire south are on high alert and will be ready at a moments notice to responds to any emergencies. Director of the Psychotrauma Unit Miriam Ballin said: "We strongly encourage anyone who is suffering emotional or psychological trauma to the tense situation currently developing in the south to call United Hatzalah's dispatch and command center at 1221 and request assistance. Our volunteers are highly trained and at the ready to assist anyone in need of assistance." The IDF continues to strike terrorist targets in Gaza in response to the rocket barrage. One of the targets struck was a terror tunnel leading into Israeli territory from Gaza. The escalation in violence with Gaza began when a barrage of mortar shells was fired from Gaza at nearby Israeli communities Tuesday morning. The IDF released a statement blaming the Islamic Jihad terrorist organization for the rocket and mortar attacks on Israel: "This is a serious, dangerous and scheduled terrorist attack against civilians and children. The Palestinian Islamic Jihad organization is a terrorist organization that is based on Iranian ideology and funding, and today it used Iranian-made weapons." Defense Minister Avigdor Lieberman said: "Today, this afternoon, we attacked terrorist infrastructures, including another tunnel, in Gaza, in a massive and powerful manner. Hamas and Islamic Jihad are already paying a heavy price, and the bill has only just been submitted to them."